The next 17 days the Dodgers play out a brutal schedule without a day off. They start off today with ten consecutive days on the road, only to return home and play another seven without a break. All this added to the fact that their NL West rivals all have at least one day off. Some having as many as three rest days during this same stretch. This afternoon, in Manny Machado's Dodger debut, the Blue Crew faces the Brew Crew. That will be three games at Milwaukee, a resurgent team with a 55-43 record. Add to that they're a hungry team for a victory after being swept in five games at Pittsburgh prior to the break. 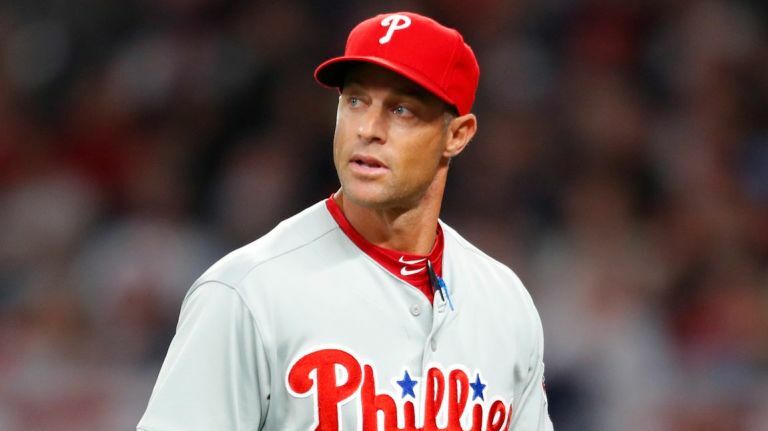 This initial series will be followed by three games at East Division leading Philadelphia, where former Dodger Director of Player Development, Gabe Kapler, has the young Phils playing their best baseball in years. And just when you think the Dodgers would catch a break, they Dodgers fly into Atlanta for four games against a Braves club that is 1/2 game behind the Phillies. They don't call it Hotlanta for nothing too. Humidity in Georgia is expected to be aroung 80%. The team returns home for a short stretch against the Brewers again for three and then the 2017 World Series rematch against the Astros, another three game series. The Houston series is bound to receive a nationally televised game and inevitable national attention as well. That’s seventeen games against first and second place clubs with a combined .623 winning percentage. Not ideally what we wanted coming out of the All Star break, but there are two ways to look at this. 1) There is the potential of being buried. 2) There is the opportunity to make a statement. Let’s hope for the latter. Manny Machados arrival couldn't have come at a more opportune time. The end of an amazing era is approaching. According to my count, only twenty players that wore the Brooklyn Dodger uniform in a major league game remain alive. The youngest of the bunch is Bob Aspromonte at age 80. Sadly, father time is telling us that within the next 10-12 years, there may not be any living Brooklyn Dodger players. I can imagine that as the survivors dwindle down to the last few, there will be some publicity surrounding them, as morbid and unsettling as that seems. Amongst the remaining of the beloved Brooklyn Bums are Hall of Famers Sandy Koufax and Tom Lasorda. Additionally former MVP and Cy Young winner Don Newcombe and notable All Star Carl Erskine are still with us. In the past couple of years, some beloved stars have passed. They include Don Zimmer, Ralph Branca and Ed Roebuck. At age 95, Eddie Basinski is the oldest living former Brooklyn Dodger. A shortstop and second baseman. Basinski payed the 1944 and 1945 season with the Dodgers as a 21 and 22 year old. He was traded to Pittsburgh in 1946 and only played one more major league season, the 1947 season with the Pirates. A player that wouldn't give up the dream, Basinski continued to play in the minor leagues until age 36 in 1959. He played the last eleven years of his career in the Pacific Coast League, primarily with the Portland Beavers, where his settled and worked in the trucking business until retirement. The PCL was a very competitive league in the 50s and many players made a living in that minor league outpost. Basinski was one of them. 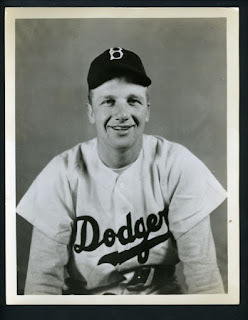 Tim Thompson was signed by the Dodgers in 1947, but he didn't see action with the big club until 1954, and it was a 10 day stint at the beginning of the season. He was used in mainly pinch hitting appearances. There wasn't a lot of room on the roster for catchers during the Campanella years. Thompson was dealt to the Kansas City A's in 1955 where he saw more major league action for an additional two years. Tim was a scout for the Dodgers, Cardinals and Orioles. He coached the Cardinals in the 1981 season under manager Whitey Herzog. 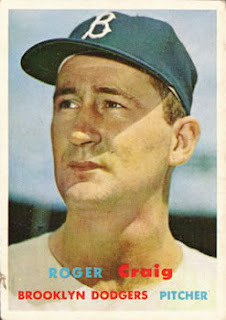 A veteran of 11 major league seasons, Wayne Terwilliger spent only the second half of the 1951 season as a Brooklyn Dodger after being acquired in a multi-player trade with the Cubs. Wayne saw action in only 25 games as a Dodger, and started only 8 of them. He went on to have a legnthy career, mainly as a utility infielder with the Washington Senators, New York Giants and Kansas City Athletics. Pitcher Chris Haughey may be the "Moonlight Graham" of the Dodgers. On the final game of the 1943 season, Manager Leo Durocher handed the ball on this 18th birthday to Chris Haughey in Cincinnati against Johnny Vandermeer and the Reds. The kid held his own, taking the loss while giving up 3 earned runs over 7 innings in a 6-1 Dodger loss. As expected, this teenager in the bigs had his jitters. Haughey walked ten in his seven innings of work. Interestingly, Al Campanis was his second baseman and Gil Hodges played third. Haughey went off to war and didn't return to organized ball until 1946. He never returned to the majors, playing in four minor league seasons before leaving the game after the 1950 season. Randy Jackson was acquired by the Dodgers from the Chicago Cubs organization in 1956. This third baseman played the final two seasons in Brooklyn and the inaugural L.A. Dodger season in 1958 before finisihing his career with the Cleveland Indians. A 2-time All Star with the Cubs, Jackson was acquired via trade with the idea that he would take over third base for an aging Jackie Robinson. Jackson injured his knee in 1957 and never played more than 64 games in a season the rest of his career. 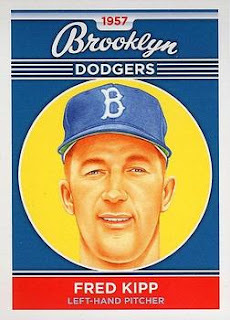 He hit the final Brooklyn Dodger home run on September 28, 1957, an 8-4 win over the Phillies. Jackson was a college football star, starting as half back for TCU and then the University of Texas in consecutive Cotton Bowl appearances (1945 and 46). A teammate of NFL Hall of Fame Quarterback Bobby Lane. Don Newcombe was on his way to a Hall of Fame career before alcoholism derailed it. A great Dodger from 1949 to 1958 (with two years away from the game due to Military Service), Don won the Cy Young Award and MVP in 1956. A career .271 hitter, when Newcombe finished his playing days in Japan, it was as a position player in the outfield and first base, not on the mound. A key contributor in the Dodger front office in Los Angeles, Newcombe is beloved by the organization and has been instrumental in assisting the organization as the team's Director of Community Affairs and later Special Advisor to the Chairman on the Team. The respect he has gained has reached even Presidential levels. 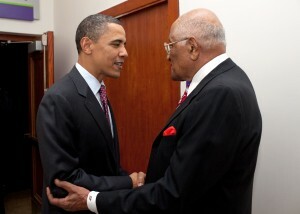 In 2010, President Obama told a national audience that because of pioneers like Don and Jackie Robinson, he was able to accomplish the feats he had reached in life. Bobby Morgan was a utility infielder for the Dodgers in 1950, 1952 and 1953. Groomed in the Dodger system, he didn't ever really get the opportunity to play full time with them due to the log jam in the infield with Pee Wee Reese, Jackie Robinson, Billy Cox/Junior Gilliam and Gil Hodges. Traded to the Phillies before the '54 season, Bobby got his chance and became their full-time shortstop while hitting .262. 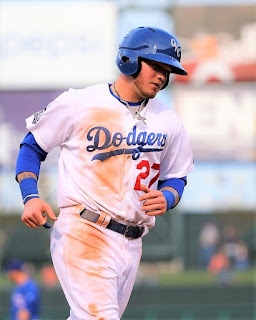 Morgan said the following about his Dodger debut: "We were playing in Philadelphia and I was the starting third baseman. I kind of stood on third base during the national anthem and looked around and said 'Good Lord, look at this. What a dream come true.'" A witness to world history, Morgan as a young soldier was stationed in Nuremberg, Germany where as a G.I. he was tasked with overseeing the Nuremberg war trials. A beloved Brooklyn Dodger through and through. "Oisk" pitched for Brooklyn from 1948 until their departure in '57. His feats included two no-hitters, a 20 win season and a World Series performance for the ages in '53 where he struck out 14 Yankees in a game three 3-2 victory. It was a World Series record at the time. An Anderson, Indiana naive,. Carl has lived a productive life in the insurance industry in his local community. The author of two books on his Brooklyn days, Carl forged a deep connection the the Brooklyn community. He also founded the "Jimmy Foundation," after his son Jimmy Erskine, helping Down's Syndrome children and adults. As a philanthropist, a book could be written about Carl's amazing life. From school donations, the Jimmy Foundation, to the Baseball Assistance League Board of Directors. In 1953, Erskine started the first Dodger game ever played at Holman Stadium in Vero Beach. He also closed out the Dodgers final appearance there in 2008 by playing the National Anthem on his harmonica. Tom Lasorda meandered through the Dodger minor league systems for most of his career, starring for the Montreal Royals in 1953-55. He had two call-ups, one in 1954 and another in 1955 with Brooklyn. In the only game Lasorda ever started as a Dodger, he walked 3, gave up a hit and had 3 wild pitches, ( a major league record). He left the game after gutting out the first inning. He suffering a gash on his leg as he was spiked covering the plate following the final wild pitch that he uncorked and he had to leave the game to get stitched up. Lasorda pitched with grit, soft tossing 80 MPH stuff and a curveball, but he couldn't get past the AAA level. The Dodgers sold him to Kansas City in 1956 where he appeared in 18 major league games without much success. 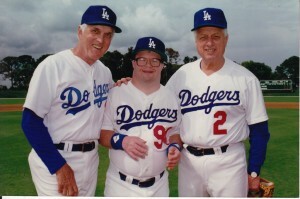 Eventually Lasorda returned to the Dodger organization in 1957, where he remains to this day. Tommy Brown served as a vital utility player for the Dodgers from 1944 to 1951 when he was traded to the Phillies. He holds a major league record that will probably never be broken as the youngest player to homer in the majors as a 17 year old in 1945 during years when the majors were depleted of a lot of talent due to World War II. Brown was a home grown player born in the borough of Brooklyn. Joe Landrum pitched in 16 games for the Brooklynites in 1950 and 1952 between stints in the minors. Joe's son Bill also pitched in the major leagues from 86 to 93 primarilly with Cincinnati and Pittsburgh. Joe Pignatano is the only remaining Brooklynite of the group, that continues to live there to this day. A backup catcher that was with the Dodgers from '57 to '61, Joe finished his career with the lackluster Mets in '64. He was a close friend of Gil Hodges who hired him as bullpen coach with the Washington Senators and eventually the Mets, where in 1969 he earned a World Series ring. Pignatano caught the last four innings at Ebbets Field in 1957 when he entered the game for Roy Campanella. Joe is the cousin of former Dodger/Red and Met John Franco. As much as Roger Craig is remembered by many as the arch enemy Giants manager of the mid to late 1980s, he was a great Dodger. A World Champ with the '55 Dodgers in his rookie year. He was a key component to that championship club. By 1959 he was arguably the staff ace, again winning a World Series ring in Los Angeles' 2nd year at the coliseum. Craig was picked up by the '62 Mets in the expansion draft and was repeatedely a hard luck loser of 24 games with the worst team in baseball history. In '63 he lost 22 games, despite having an ERA of 3.78. Truth is, you have to be quite a talented pitcher to lose twenty games. Craig was that. Ron Negray pitched in four games for the 1952 Brooklyn Dodgers. Another player buried in the Dodger farm system, he got his chance in the majors after the Dodgers traded him to the Phillies in 1955. 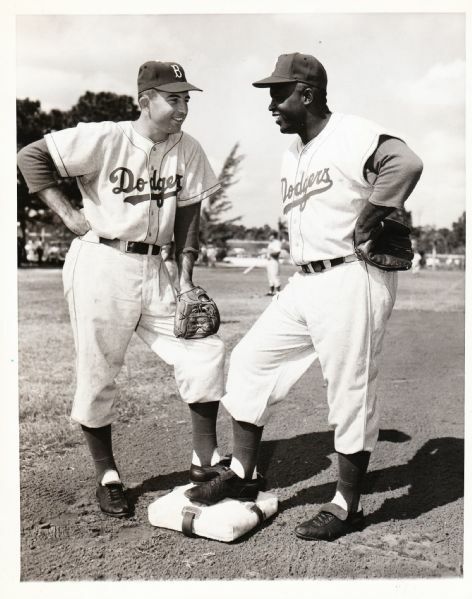 Negray returned to the organization in the Dodger's inaugural season in L.A. in 1958. Negray carries the distinction of being the first Los Angeles Dodger to start an exhibition game, on March 8, 1958, vs. the Phillies in Miami, Florida. In a 2016 interview Ron spoke of his reverence for Jackie robinson. When Negray was overlooked when pennant winning watches were awarded to players on the 1952 roster. Three years later, Negray was a Phillie and Jackie approached him and gave him his. Glen Mickens had four pitching appearances in July 1953 before being scuttled back to the minors, never to return again to a major league mound. Stuck in a stacked Dodger minor league system, Mickens played the final 5 years of his career in Japan with the Kintetsu Buffaloes from 1959 to 1963 with much success. As a Brooklyn Dodger, Fred Kipp only pitched in one game vs. the Cubs at Wrigley Field. He never took the mound in Ebbets Field. As a L.A. Dodger in 1958 he saw action in 40 games before his career fizzled to an end with scarce Major league appearances in 1959 and 60. Kipp is the last living person to play for Brooklyn and the NY Yankees. He wrote a book on his experiences titled "The Last Yankee Dodger," and is doing the book tour circuit as well. Six time All Star Jim Gentile played only 4 games in Brooklyn and a 12 games in the L.A. inaugural season before being traded off to the Orioles in 1959. He excelled as a fine first baseman in Baltimore where in 1961 he hit 46 homers and drove in a whopping 141 runs. 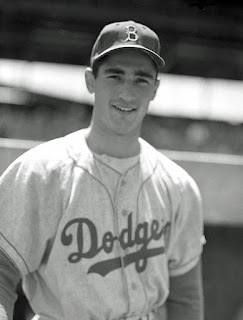 Don Demeter played just three games as a Brooklyn Dodger in 1956 before having a stellar 10 year career from 1958 to 1967, earning a World Series ring with the '59 Dodgers as a frequent outfield fixture. His 18 homers in '59 played a key role in the Dodgers World Series Championship run. After his career ended, Don entered the Ministry where he is currently a Pastor at Grace Baptist Church in Oklahoma City, OK.
A bonus baby signing out of the University of Cincinnati where he was primarily a basketball player. This Brooklyn native and fireballing lefty was signed after a December, 1954 tryout to a $20,000 contract that required him to remain with the big club for two full years. This hindered the young man's career, as he obviously could have used some minor league seasoning. 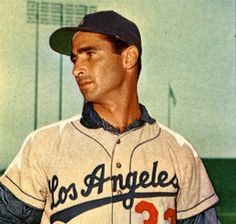 Koufax pitched for Brooklyn from 1955 to 57, showing glimpses of his future greatness, this included two consecutive shutouts in his rookie year, (the first with 14 strikeouts) as a 19 year old. Now known as the greatest pitcher in Dodger history, Sandy has the distinction of winning a World Series ring in Brooklyn though he never sniffed the mound on either Brooklyn team he was a part of that played in the fall classic. 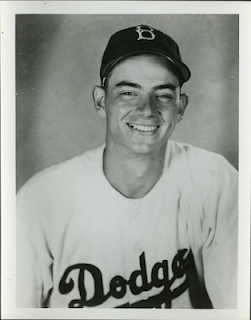 Of the remaining Brooklyn Dodgers still alive, Sandy is the lone Hall of Fame player remaining, (with Lasorda earning the honor as the L.A. Dodger manager). With a long and distinguished major league career, Bob Aspromonte had 4,799 plate appearances over 13 major league seasons. Only one was as a Brooklyn Dodger, and it was in the 8th inning of a 17-2 Dodger blow out over the St; Louis Cardinals on September 19, 1956. Bob struck out. Aspromonte eventually made it to the majors by 1960, and in '61 he was left unprotected in the expansion draft, selected by the Houston Colt 45s. Bob led off for Houston in their 1962 debut, being the first batter in their franchise history. He spent the remaining years in the majors with Houston, Atlanta and eventually closed out his career in 1971 was a New York Met. He is the last Brooklyn Dodger to play in the majors, having faced Hall of Famer Steve Carlton in his final game, on September 28, 1971 at Shea Stadium. Here come the asinine trade deadline proposals. Some enjoy this time of year. I, on the other hand, cringe as I follow twitter feeds in the final hours of the trade deadline season. It is a time to fear the type of acquisitions that often are regretted for years to come. So we approach the final weeks before the trade deadline. That annual event when cellar dwellers attempt to strip the Dodger farm system cupboard bare. As always, it's a sellers market and often times, teams tempted to go for the brass ring at all costs show a willingness to peddle off two or three times the talent they would get in a typical off-season deal. The latest lackluster franchise trying to rip off the Dodgers this go-around is the Baltimore Orioles. With shortstop Manny Machado out there for the taking. Teams know he is is a two month rental before he enters the free agent ranks with Dan Lozano as his representative. We can argue until the wee hours about Machado’s value to the Dodgers, but short of bringing them a World Series championship, it may be unwise for L.A. to give up Alex Verdugo, Yadier Alvarez and more for this guy. A name like Rancho Cucamonga starter Dustin May comes to mind. 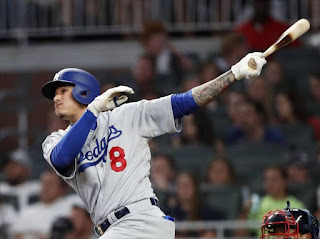 Manny Machado's offensive prowess is unsurpassed, but do the Dodgers really need to trade away the farm for a guy that won’t be a Dodger after 2018? Or do they risk allowing him to sign with Arizona and possibly losing their 5 year reign on the Division Title? If you recall last season, the Dodgers were apparently a player in the J.D. Martinez sweepstakes before the Diamondbacks landed him. He then absolutely raked in the N.L. West. As good as that move was, it still didn’t get Arizona the Division, nor a deep entrance into post season. This is the conundrum that the Dodger brass must face. They can pay big for a chance at the brass ring or ride the ponies that are already in place. There is little doubt that an addition of a premium bat in that lineup will really help, and infuse enthusiasm in the entire ball club. This could be the type of impetus that puts them over the top. This Dodger team is made up of professionals, veterans that have now experienced that taste of an N.L. championship, and they were within an eyelash of winning the whole thing. They shouldn’t require that emotional lift, but they’re human too. We’ve all seen what an offensive addition at the deadline can do. Remember 2008 and Manny Ramirez? With the starting pitching beginning to come around, and some bullpen guys such as Alexander and Hudson hitting their stride, the starting pitching arms look to be lined up for the stretch run. Perhaps the injuries were a blessing in disguise as hurlers like Kershaw, Hill, Maeda and Beuhler should not be fatigued with heavy inning loads by September. We all saw that some of the pitching was on fumes in the 2017 post season. Aside from the aforementioned starters, L.A. is looking at the possible return of Ryu and Urias as well. Emergent and surprising ace Ross Stripling will likely be fatigued, but hopefully others picking up the slack will allow him to not be pressed into as many high stress innings as he has this first half. 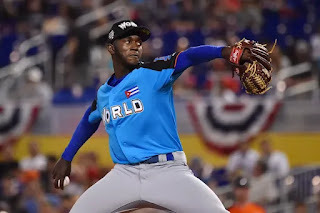 He is a pitcher that has matures and come into his own in 2018. Zaidi and Friedman have utilized the ten day DL to grant relievers some rest. Guys like Fields, Cingrani, Alexander, Liberatore, Goeddel and Paredes have had their share of rest and bounces back to the minor leagues. Another key bullpen acquisition may be in the cards, but it may have already occurred with the acquisition of Dylan Floro from Cincinnati. The coming weeks will also play a part in the Dodgers midseason trade activity. If the ball club continues to excel as it has for the past six weeks, the urgency for change may not be as apparent. Undoubtedly this all plays a role in the psyche of the front office as the deadline looms but this Dodger club continues to be on the cusp of another pennant and potential World Series Championship. There are those that argue that the Dodgers would have the World Series ring had they not made the deadline deal for Yu Darvish. It is interesting argument, that's for sure. Back in 2012 when I initially wrote about a young Dodger signee out of Cuba named Yasiel Puig, I knew they had found a great talent. While most of the baseball world coveted a power hitting outfielder eventually signed by the Cubs named Jorge Soler. Puig flew under the radar of many scouts for a number of reasons. Primarily because of his inactivity from baseball due to his banishment from the Cuban League caused by attempted defections. His signing to a 40 million dollar contract in 2012 was scoffed at by most of baseball's establishment. Vin Scully saw it early as well, dubbing him the "wild horse" in his first week of play. He was essentially a wild mustang full of potential that needed to be tamed and shown the ropes. Looking back at Puig's start, it is really unfair that the Dodgers moved him almost immediately to the highest level of play. Yasiel Puig became a major leaguer with 14 games experience at High A in 2012 and 40 games at the Double A level at the start of the 2013 season. His immediate impact on the league was of historic measures, drawing comparisons to hall of famers such as Roberto Clemente. Inevitably the league scouted him with intensity and then started exploiting his weaknesses. 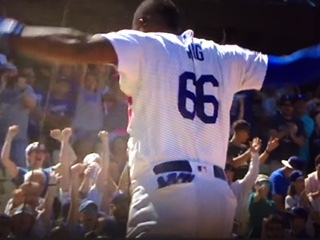 Love him or hate him, Puig is unique. And the hatred is out there. Detractors have criticized him from the beginning. Some will never come around and accept his talent. Some will always look at his antics as showboating instead of attempting to understand where he comes from. Who gets the rounds of boos in opposing ball parks the most? Who rankles the emotions of opposing rivals and pitchers such as Madison Bumgarner and former Giant 3rd base coach Tim Flannery? Who is the Dodger player that has been the center of mini brawls and verbal jawing over the years? Who raised the ire of teammates and even both Don Mattingly and Dave Roberts? Call him immature if you will, but the truth is, Yasiel is misunderstood. And as the quote about walking in a man's shoes states, none of us and I repeat NONE OF US can even come close to experiencing the horrors that Yasiel Puig faced in his trek to the United States. Few big leaguers were fast tracked as quickly as Puig was to the Major Leagues. Add that he had to learn a new culture, and language. He went from having virtually nothing in earthly possessions, having his life threatened, held hostage by smugglers, being kidnapped, threatened. Experiencing the dregs of human traffickers to being a multi-millionaire over night with very little seasoning and instruction. None of us can even come close to understanding Yasiel Puig's thought process. Perhaps one day we'll know his whole story. It would be fascinating. There is one thing that we can understand. The man plays with passion. He cares about his performance. He wants to win. He has a love for the game. Some may view his antics in a negative light, but perhaps they are the ones that should learn something about the man's background. If you haven't walked in his shoes, how could you possibly understand? So though today's antics after stealing a run on the base paths with the celebratory flailing of his arms will probably have repercussions when he plays the Rockies in the future. 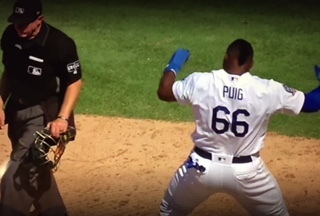 The truth is, Puig doesn't care. He is is exciting, excitable and an amazing talent. As his baseball IQ rises, so will his impact on the game. Yes, he's a wild horse and he always will be, but he's "our" wild horse, and for that reason, he's either loved or hated. I'll choose the former.